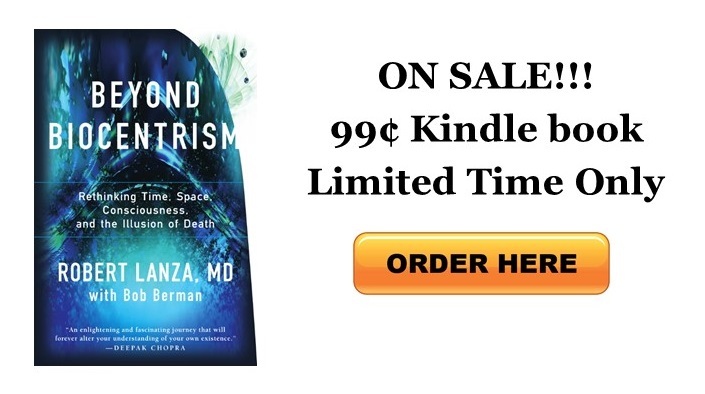 Deepak Chopra: My special guest is Dr. Robert Lanza and his extraordinary mind, I just finished reading his book Biocentrism and I said to myself, “Finally, aha, somebody that I can totally relate to.” The book is Biocentrism it’s in the bookstores and online bookstores. I actually have it on my Kindle because I read it over and over again. Let me just tell you who Dr. Lanza is if you haven’t heard about him and you should have. Dr. Lanza is considered one of the leading scientists in the world, he’s currently chief scientific officer at Advanced Cell Technology and adjunct professor at Wake Forest University School of Medicine. He has hundreds of publications and inventions and over 20 scientific books. Among them Principles of Tissue Engineering which is recognized as the definite reference in the field. I could go on for a long time giving his credentials. You can just go on Wikipedia and check him out. Dr. Robert Lanza. You know, but some among the few things that really are extraordinary, Dr. Lanza has cloned the world’s first embryo for the purpose of generating embryonic stem cells. In 2001 he was also the first to clone an endangered species (a Gaur) and in 2003, he cloned an endangered wild ox from the frozen skin cells of an animal that had died at the San Diego Zoo nearly a quarter-of-a-century earlier. So take these cells, this information from an animal that no longer exists and create a, resurrect literally an endangered species. Dr. Lanza and his colleagues were also the first to demonstrate that nuclear transplantation could be used to reverse the aging process and to generate immune-compatible tissues, including the first organ tissue engineered from cloned cells. Recently he has generated along with other colleagues something called induced pluripotent cells, so the pluripotential cells are cells that have all possibilities in them. They haven’t committed themselves to each other which is what stem cells are, but human iPS cells that Dr. Lanza created came from skin cells, never been done before, by direct delivery of proteins, this eliminating the harmful risks with genetic manipulation. But today we are going to talk to him mostly about his book and a little bit about these other contributions of his to the world of science. And we have him for the full hour which is a great privilege. Dr. Lanza are you there sir? RL: Yes thank you, it’s a great pleasure to join you. DC: No, thank you for joining me and where are you right now? In Boston? RL: Just outside of Boston in a city called Worcester. DC: Okay, you know I lived in Boston for 23 years so after my internship I did my… first I did my fellowship/residency at the Lahey Clinic and then I went on to the Deaconess and the VA and you I did… I trained endocrinology and then subsequently neuro-endocrinology so my children grew up there and then I’m so familiar. I miss Boston now. RL: It’s a very nice city. DC: Yes. So Dr. Lanza so many things to talk about we’ll get to your book immediately, very soon, but I think you’re on the forefront of stem cells research and just to the audience that doesn’t really understand the significance of stem cells as pluripotent cells that can be literally coaxed into becoming anything. It would be nice to hear your perspective on that. RL: Yes. It’s a very exciting field and in fact we’ll be filing an IND with the FDA in the next few months to actually use these cells to prevent blindness. We’ve also gotten our research that was published where we show that these cells actually the same human cells we would have actually used in patients when you use them in animals you can actually cut the death rate after a heart attack in half. We could actually restore the blood flow to limbs that would otherwise would have have to be amputated to completely normal in a month. So someday in the near future hopefully rather than having a foot or a leg amputated we’ll just give you an injection of the cells and restore the blood flow. We’ve also created entire tubes of red blood cells from scratch in the laboratory. So there are a lot of exciting things in the pipeline. DC: Now my imagination says and you must correct me if I’m wrong because I’m not an expert in the field, I’ve been away from academic medicine for quite a bit of time but my imagination says that based on the fact technology including biotechnologies is moving so exponentially, it almost doubles in less than eighteen months, which literally means that in ten years the power of technology and that includes biotechnology could be a million times what it is today. So my imagination says that the day will come when you’ll be able to take perhaps cells from your own skin and then you know derive stem cells as you have already done and inject to replace any organ in the body that is damaged. Is that in the realm of imagination? RL: Absolutely. Ah. It’s absolutely within the realm of reality probably within the lifetime of most of the listeners to this program. In fact when you combine stem cell technology with the technology known as tissue engineering you can actually grow up entire organs, so as you suggest that sometime in the future you get in an auto accident and lose your kidney, we’d simply take a few skin cells and grow you up a new kidney. In fact this has already been done. We’ve done some work with Tony Atala’s group at Wake Forest where he has actually grown up entire bladders from just a few cells and these have actually gone into patients. Some of our early work with him making primitive kidneys actually was quite successful. So yes, this is real this isn’t science fiction. 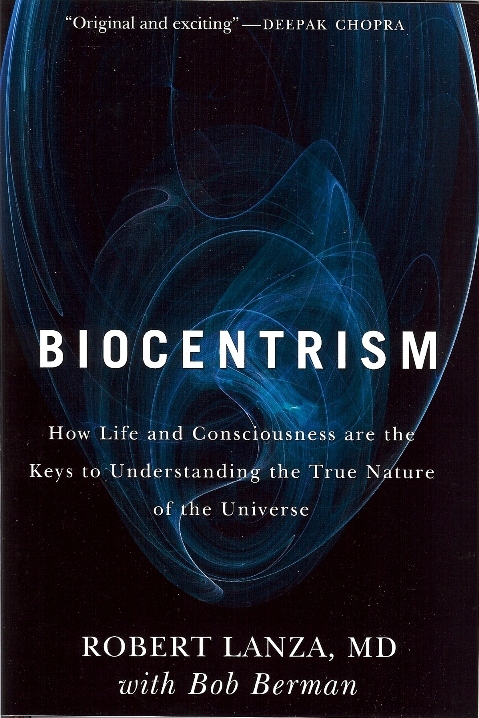 DC: I’m speaking to Dr. Robert Lanza, his book is Biocentrism, what is the subtitle of the book Dr. Lanza? RL: It’s How Life and Consciousness are the Keys to Understanding the True Nature of the Universe. A mouthful. DC: (laughs) Biocentrism: How Life and Consciousness are the Keys to Understanding the Universe. We’re going to come to that but getting back to your field which is also tissue engineering. What you just said about stem cells and also in the near future nanobots or nanotechnology which can kind of in a sense move atoms around will probably make it possible to just about repair any organ or replace any organ in the body so that theoretically what you’re saying is that one could probably live indefinitely. RL: Yeah they’re like ambulance cells and when you inject these into animals for example that have damaged retina or eyes, if you label them with a dye that’s green you can actually follow them and they will home right to the site of injury and within 24 hours fix that damaged vasculature. Where as in the other that is normal it does nothing. So these are cells that are very smart so that as you suggest by simply injecting these cells they know where to go in the body and repair damage. Be it a heart attack or damage anywhere in your body. In fact we think they might be able to reverse the progression of atherosclerosis and certainly all sorts of other vascular damage. DC: We’re seeing this amazing, amazing technology almost double almost 12-18 months, the power of technology. It is almost unimaginable what this might be in say two, three decades, or a century from now. But what we’re learning just now from Dr. Lanza is that some of these things that we have been talking about are in our lifetime and in fact as we begin to understand how we extend our lifespan then we may actually one day glimpse even the more advanced technologies that Dr. Lanza has been talking about. You know I had on my show Dr. Michio Kaku who is the person that first described string theory and he’s written a new book called Physics of the Impossible which the Science Channel is going to do a twelve part series on and you know he was basically saying based on what we understand in biophysics and I’m going to come to your take on this later because I agree more with you than with anyone else that I have ever met. Basically what he was saying based on our current laws of understanding, our current understanding of the laws of physics if some thing in the future, some imagined technology in the future does not violate our laws of physics then it is not impossible. It is possible and so he was talking about teleportation, he was talking about parallel universes, he was talking about bi-location, he was talking about time travel even into the past and influencing your ancestors in a way that you could be alive in one universe and not exist in another universe, etc. So you know we’re right at the frontier at the amazing understanding of reality but what you’re saying which has really interested me for a long time. In fact that’s why I left the world of medicine and went onto, on my own and started speaking about consciousness almost 25, 30 years ago I was considered an outcast. At least in my circles. So I stuck with the general public hoping I would be able to share my ideas which weren’t my ideas, which were part of a wisdom tradition that I had grown up with, with people that were not experts. But what you’re saying right now in your book Biocentrism is that the physical universe would not exist unless there was a consciousness in which it could be conceived, constructed, and came into existence. That consciousness is primary and everything else is secondary to that. RL: Yes, yes. That’s absolutely correct and in addition to that life just isn’t an accident of the laws of physics. There’s a long list of experiments that suggest just the opposite. Amazingly when you add life and consciousness to the equation you can actually explain some of the biggest puzzles of science. So for instance it becomes clear why space and time and even the properties of matter itself depend on the observer in consciousness. In fact when you take this point of view it even explains why the laws of the universe themselves are fine tuned for the existence of life. DC: I’m speaking with Dr. Robert Lanza, his book is Biocentrism. The publisher is… Who is the publisher? DC: Okay, BenBella Books and we’re going to be featuring it on our site deepakchopra.com so we’re talking about the principle of biocentrism and what Dr. Lanza is saying first of all is that the universe is so fine tuned with certain universal constants that if there was even a slight deviation from those constants we, you and I as biological organisms would not exist. And so it does not seem to be a random accident that started with the Big Bang. In fact you’re also saying that the entire history of the universe from the Big Bang to the moment that consciousness appeared is now an imagined history. That it existed as probability states but not as space-time events. RL: Absolutely. And as you do point out there’s a long list of traits all the way from atoms to stars that make everything since the Big Bang to the present time appear as though it was tailor made for us. So for instance if the Big Bang had just been one part in a million more powerful the cosmos would have blown out too fast for stars and worlds to form. The result of course is no us. Again there are over 200 parameters so exact that it really strains reason to think that they’re purely random. You tweak any of them and you never existed. So again without biocentrism or introducing consciousness or life into the equation none of this makes any sense. DC: You know I’ve had on my radio show fortunately some of the greatest minds, academic minds in the world of neuroscience and also in the world of philosophy and consciousness, no one yet has explained to me that when I close my eyes and I imagine a rose or a picture of a red rose or a sunset on the ocean where that picture is? I experience that picture subjectively in my imagination or I can think of my mother and see her face. That experience is not in my brain and you know my brain shows firing of electromagnetic impulses in synaptic networks but now as you point out in your book as well we can look inside the brain through positron emission tomography or MRI’s. We don’t see pictures of sounds or tastes or textures. Those are experiences in consciousness and nobody has been able to actually locate that consciousness. The brain of course shows electrical phenomena but those electrical phenomena are not the experiences and similarly when I look at a red rose instead of imagining it, I see it out there but the experience is in my consciousness not even in my brain because it’s not even in my head. In my head are these electrical impulses. I think all experiences whether we have them all subjectively or objectively are in a transcendent domain which is beyond space and time because as you point out, space and time are also felt-sense experiences and therefore not independent of our consciousness. RL: Yes you’re absolutely right. You know we think that space and time are these hard, cold objects but if you wave your hand through the air and you remove everything what’s left? The answer of course is nothing so the same thing applies to time. You can’t really put it in a bottle like milk. So if you look at anything say the radio. You can’t see that through the bone that surrounds your brain, in fact everything you see an experience right now is just a whirl of information occurring in your mind and space and time are simply the minds tools for putting it all together. Take something as ordinary as the weather outside. You see a blue sky but the cells in your brains can be changed so it looks red and green. You think it’s bright out but the brain circuits can be changed so it looks dark out. You think it feels hot and humid but to a tropical frog it would feel cold and dry. In any case you get the point. This logic applies to virtually everything. The bottom line is that anything you see could not possibly be present without your consciousness. DC: You know what you say is just totally music to my ears. You know in the tradition I grew up in: Vedanta they had these beautiful expressions. I’m not in the world, the world is in me. I’m not in the body, the body is in me. I’m not in the mind, the mind is in me. As I curve back within myself I experience my mind in my consciousness I experience my own body in my consciousness and I experience my whole world in my consciousness. So that consciousness exists outside of space-time because it actually conceives and constructs space-time as well and therefore being outside of space-time, transcendent it has no beginning and time, it has no edges in space and therefore it has no ending in time as well. You know the whole goal of Eastern wisdom traditions has been to experience this as our identity. That even when I think about the brain that in thinking about the brain is in consciousness. When I mathematically conceive of the laws of nature they are still in my consciousness. You know you’re coming from a very scientific perspective but essentially saying the same thing. RL: Absolutely. I couldn’t have said it any better than you just expressed it. We’re arriving at exactly the same point in the book Biocentrism, basically I’m taking all of the existing science and basically I’m arriving unequivocally at the same end point that you’ve just described. DC: And you know I’ve had some confrontations with Richard Dawkins and I don’t mind saying that I found him extremely arrogant and you know attacking a straw man that really doesn’t exist as God. But totally not in a way even caring to look at the mystery of consciousness which remains a mystery. Even Dr. Daniel Dennett’s book Consciousness Explained is in a sense explained away. Nobody really addresses the mystery of consciousness and the fact that people constantly look for consciousness as a kind of biophenomenon or as a phenomenon byproduct of the brain just so because we can map out what we’re thinking with correlations in certain parts of the brain doesn’t really explain consciousness. RL: As a matter of fact you’re absolutely right. The book is called Consciousness Explained and many people say, they nickname it Consciousness Ignored. RL: (laughs) He’s missing the very central core of what consciousness is all about. DC: Yeah. So you know what is striking to me is that your expertise is in the world of biology but you’re also and you’re, you’re expertise is such that you’re pioneering some of the most amazing technologies of the future but you do take the stand that consciousness comes first and everything is constructed. Why is it so difficult for people to imagine that when a honeybee looks at a flower it doesn’t see the same flower as you and I see because it’s sensing ultraviolet and not the usual wavelengths that you and I see? That a chameleon’s eyeballs swivel on two different axis and I can’t even remotely imagine what this room would look like to a chameleon. Or the fact that whales communicate through infrasonic and dogs here things that we don’t hear because the instrument is different. In the Vedanta we say that the fault of the instrument is not a reflection of the user of the instrument. You’re the user of the instrument and you know you can manipulate the instrument any way you want as you just said change the weather if you want. RL: Yea well we were actually evolved as monkeys in the forest trees that collect fruit and berries. We were never really designed to understand the universe. You know in that sense the world, the way we see it is very much like a chipmunk or squirrel. The squirrel opens his eyes and the acorn is just miraculously there and he grabs it and he scurries up the tree without any further thought, but we humans are really the same. 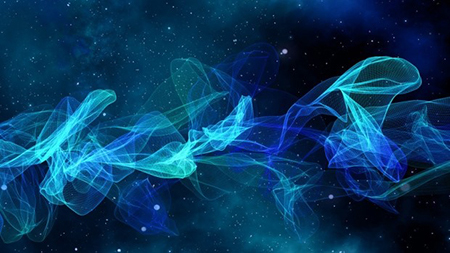 We wake up in the morning and voila the world is just magically there but again new experiments are showing very consistently that not a single particle exists with real properties if no one is observing it. Reality is a process that involves our consciousness but it requires that you think about what is going in. People don’t stop and think. You can’t see anything out there through the bone around your brain and clearly that is completely reconstructed in your brain and as a physician you know well that people for instance like remember the movie A Beautiful Mind, people with schizophrenia they see people and things that are just as real. Your mind absolutely has the capacity to reconstruct and create a reality just as real as anything you are experiencing right now. Even in dreams that proves the capacity. So again everything you see now again has to be reconstructed in your mind. DC: I’m speaking to Dr. Robert Lanza and we’ve been talking about his extraordinary book Biocentrism and we’ll come back right after this and thank you for staying on for the second half of the show. DC: We’ve been talking about some of his research but now we’re actually continuing our conversation on biocentrism. Basically what you’re saying is that our brain which is encased in a bony skull has no experience of a so-called outside world. The brain cells respond to things like pH, electrolytes, our body temperate, hormones, and so forth and ultimately all this activity is translated into ionic shifts across neural cell membranes and somehow mysteriously gives us the experience of color and sound and shape and texture and smell, not in the neurons but in our consciousness. But it’s really not clear how information that is processed of internal states by the brain is translated into sound, sight, taste, and smell which gives us the experience of the outside world. Am I summarizing this accurately? RL: Yes, I think the whole issue here is that, that space and time are tools of the mind that are ways of us putting things together. So when you talk about the objects you see and indeed that would include the brain and neurons you’re already dealing with a reconstruction engineered by your mind. So everything that you experience in space and time is simply your way of understanding how everything is put together. So again even when you talk about a neuron or a brain cell you’re already now in the external spatial-temporal world. RL: So everything all the way from the Big Bang to the edges of the universe all that is simply an extrapolation the spatial-temporal logic of consciousness. So if you were to say that I’m standing here in a room on this continent on this earth going around the sun. If continue extrapolating that logic to its ultimate extreme you end up with the known universe. It’s very much like a globe of the Earth. You could sit here and look at this globe and say these are all the possible places I could visit out there doesn’t mean that you could actually go there it just means that that is an extrapolation of the entire whole. DC: So let’s go a little bit further for our listeners because believe it or not we’ve been having conversations like this for awhile now but never with this clarity that you are giving it and so our listeners are pretty sophisticated. Let’s take it a little bit further. Now we know from mathematics and from the world of quantum mechanics is that as we go a little bit deeper into the sub-atomic world what we call electrons for example are really probability clouds that are hovering around a nucleus which is also a probability cloud. Although difficult to conceptualize this, this probability cloud defines the statistical likelihood of a space time event. We want to call it a sub-atomic particle that as you said earlier: Until we look for it, it’s not there. It only exists as a potential. Am I correct? RL: You’re absolutely correct. Actually there was some debate in physics in the early days that these probability waves were waves of material. But it actually just turns out that they’re statistical predictions. So for instance I’m sure everything listening is familiar with the famous two-hole experiment. If you look at an electron going through the two holes if you watch it behaves like a particle and goes through one hole or the other. If you don’t look at it, it acts like a probability wave and can go through both holes at the same time. The reason that is so is because it’s not being observed there is no reality. You have not laid down the threads of consciousness as to where it’s going to appear. It can be expressed statistically as to certain probabilities but it isn’t real until it’s observed. DC: So you know here’s something I do sometimes with my audience and um you know I’m for the first time beginning to get even more clarity as I speak to you. So, and again I might be extrapolating a little bit too much here because what I’m about to say violates everything neuroscientists say. So I ask a person to, to ask them a simple question like what did you have for dinner last night and they might say I had spaghetti and meatballs. So then I say where was that information before I asked you the question? And they of course say: It was in my neurons. I say now listen, are you seeing an image of spaghetti and meatballs and who you were with last night when you had this dinner at the fancy restaurant in Manhattan and they of course are now reliving the full experience. I say where was this information and they will say it was in my neurons. I say well if I went into your neurons do you think I’ll find the pictures of spaghetti and meatballs or you know are those synaptic networks coded for spaghetti and meatballs? I slowly lead them to the point where I say that that information, that memory existed as potential memory in their consciousness and when they had the intention it was almost like a measurement. A photon went off in their neurons and it gave them the experience of they were reliving that experience and then in a moment I’ll say let’s switch from there and go back to your house to when you were a teenager or a child. Do you see that now? And they’ll immediately see that and it’s almost like a quantum leap. You know localizing another space-time event in your brain through intention is almost like the real me exists as a possibility field for potential space-time events that localize of course as experience through my brain but that real me is not in the brain, it’s not, it’s transcendent. It’s a field of possibilities, it proliferates in uncertainty, it has observer effect, it localizes in space-time events. It takes quantum leaps of imagination. You know I can move from last night’s dinner to my childhood in an instant without going through all the intervening. That consciousness seems to be what this unified field that scientists are looking for. Would you relate to that or agree with that or disagree with that? RL: No, no, absolutely. You’re absolutely correct. I think it’s a very different concept for people to fathom and to understand but let me add some teeth to this. There have been some very real experiments that have been carried out. There was an experiment that was published in one of the most prestigious journals in the world, Science last year in February. And what they actually did in this experiment is they put a particle into an apparatus and they had it go and make a choice along the way and then at the end they did something right now in the present that actually changed what that particle did in the past so the actions right now in the present, in the same universe you and I live in actually changed an event that actually happened retroactively in the past. And it’s not just you and I thinking this, I believe that if I have it correct that even Steven Hawking has now reevaluated his thinking and I think it was in an issue of Discover magazine is saying now that the present does actually impact the past. RL: So I think we’re gaining momentum here. DC: I know. I read a statement of Stephen Hawking where he said that God not only plays dice with the universe, he frequently throws the dice where you will not find it. DC: The ultimate uncertainty principle. RL: Exactly. And that’s the other thing, the ultimate uncertainty principle, as you know Eisenberg’s famous uncertainty principle, if there was really a world out there with particles bouncing around then we should be able to measure all of their properties. But you can’t so for instance if you try to measure a particles exact location and it’s momentum, they can’t be known at the same time. It’s sort of like the man and the woman in the cuckoo clock. When one goes in, the other comes out. This uncertainty is built into the very fabric of the universe and no one has a clue why and the only way this makes sense is to accept the fact that the universe is biocentric and with consciousness as it’s foundation. DC: Yeah. You know I was reading again in your book where you draw the analogy. An arrow is going through the air and somebody takes a picture of it and now you know you have it’s location but you have no idea where it is going and you know the Buddhists also talk about this you know that objects in space and impermanence in time is the same phenomenon. If I go to the ocean right now and I take a picture of the sunset and the seagull is flying and I come and show you the picture and you say let’s go see it, there’s nothing to see because what I took as a picture was a measurement that created a space-time event of something that’s slowing, something ineffable that’s in a sense transcendent and is flowing continuously as space-time events and every space-time event whether it’s a subjective experience or an objective experience is in fact a measurement in consciousness of consciousness. RL: Absolutely. Everything we perceive is actively being reconstructed in our head. So time for instance is simply the summation of these frames that occur in our minds. That doesn’t mean that there’s this invisible matrix out there called time. It’s simply our way of understanding things. DC: So tell us what made you write this book Biocentrism? How long have you been thinking about this? RL: Well ever since a child I knew there was something with the static billiard ball view of the world and when I was taking advanced physics at U Penn the material started to reach a new level of absurdity so at that point I tried to put this all together. I mean again for almost a century now science has not been able to reconcile its foundations relativity almost contradicts quantum theory. So again despite all these immense efforts of all of the greatest minds around there’s been no resolution. So clearly the foundation there’s a problem there. I think the answer of course is that space and time are not these hard external objects. Again we’re, scientists have been building from one side of nature (physics) without considering the other side (life in consciousness). Neither side exists without the other. They cannot be divorced from one another or else there is no reality. I think it’s science and physics are just starting to learn from all these experiments. These experiments have been carried out hundreds and hundreds of times in all sorts of ways that no physicist really questions the end point. I think that these experiments are very clearly telling us that consciousness is limitless and the ultimate reality. DC: And yet there are some very brilliant scientists out there both in the field of physics and neuroscience who are so in a way steeped in this world of reductionist science that they would not agree. They would say that one of these days we’re going to find consciousness as a bi-product of the brain. It’s a secretion of the brain just like you know hydrochloric acid is a secretion of your stomach or bile is a secretion of your gall bladder. And how many of your colleagues, I mean you’re such a respected scientist in your work of stem cells. How many of your colleagues actually get what you’re saying? DC: (laughs) So, um but there are scientists that you know of that agree with your point of view because I do know a lot of them. RL: Well even the great physicist Steven Wiman said that consciousness cannot be explained by the laws of physics and I mean he’s one of the greatest physicists recognized. Certainly John Wheeler agrees with this perspective and many others. DC: Roger Penrose I would say agrees with this perspective. RL: Absolutely, but I think with any kind of a paradigm shift it takes time. I think you know you, my hats off to you, you have started the movement correctly and that’s how it has to start. Presumably, eventually this will catch on and people will realize that you can’t keep brushing these experiments under the rug. That they’ve got to start now doing what science is designed to do, to try to understand everything with a single theory that really doesn’t contradict itself like the current paradigm. DC: I just wanted to remind our listeners about a few things. If you’re enjoying this program tell your friends about it. This program is also available on your iPhone so if you have an iPhone app that you can listen to this program. I just had a friend that just came back from Geneva and he was listening to this while hiking the Alps on his iPhone. And so you can do that. You can also go to intent.com and listen to all the archives. The program is repeated all day Saturday until Sunday morning. You have many opportunities to listen to this and there are some very difficult concepts here. You might want to come back again to listen to this conversation. Dr. Lanza if I arrange at some point for a video shoot of a conversation that you and I can have on exactly this topic and on your book Biocentrism somewhere in New York and then we put it on YouTube and offer it to some of the major networks, would you be open to it sir? RL: Absolutely, I’d be honored. DC: Now because I think this conversation needs to be heard by a lot of people. We’re still very much frozen in the old paradigm of reductionist, materialistic science. And you know your work and the work of many others is slowly beginning I would say to overthrow the superstition of materialism which has frozen us in a very obsolete worldview. Notwithstanding the remarkable things you can do with stem cells and other things because they’re in fact stem cells being pluripotential cells remind me of you know they’re like consciousness here in a cell saying tell me where to go. RL: (laughs) It’s very funny you know when we grow our embryonic stem cells or these pluripotent cells in this petri dish, the first thing they want to do is form neurons and want to assemble actually into an eye. I’m sure it’s coincidence but it’s interesting that organs with the perception of the first and almost the default mechanism of these cells. DC: Well it’s been wonderful having you sir and I hope we can do that filming sometime. Perhaps for PBS or any of the other outlets that we have access to and I’ll be in touch with you. RL: Great. That would be a great pleasure. DC: My very special guest has been Dr. Robert Lanza, considered one of the leading scientists in the world. He’s he’s currently chief scientific officer at Advanced Cell Technology and adjunct professor at Wake Forest University School of Medicine. 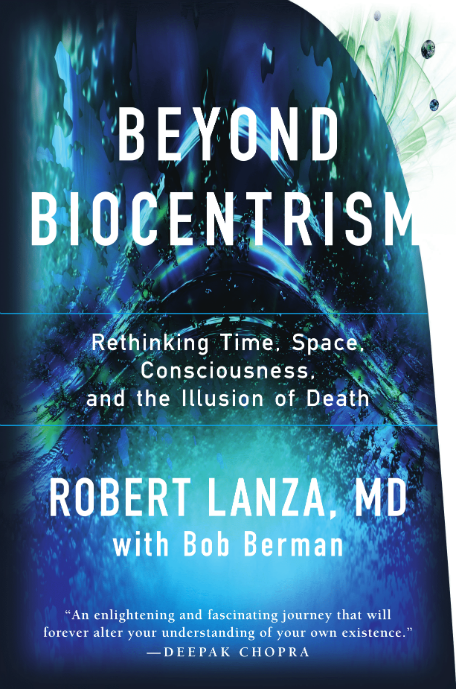 His book is Biocentrism and what Dr. Lanza is essentially saying is, is that the physical world exists in our consciousness, that our bodies exist in our consciousness, that space-time exists in our consciousness. That even when we think of the brain, that exists in our consciousness. That this consciousness is transcendent. It has no beginning in time, no ending in time, no edges in space. It’s our ultimate identity. The whole universe arises and subsides in this consciousness. The world is our projection as we interact with our own self we project and that projection appears as our relationships, as our situation, as the circumstances of our life, as New York City and as the whole universe. This is what the Eastern wisdom traditions have taught for decades and not only decades but centuries of time. Saying that the whole purpose of our life is to expand our consciousness until we can experience ourselves as infinite being and in that experience is our enlightenment because we transcend the fear of death. That all our fears come from a limited perspective where we identify ourselves with our physical bodies which is our projection or even our mind which is our projection. Or even our thoughts which are a projection, our relationships which are a projection. Those are all part of the scenery. You’re not the scenery, you are the seer in which the scenery comes and goes. 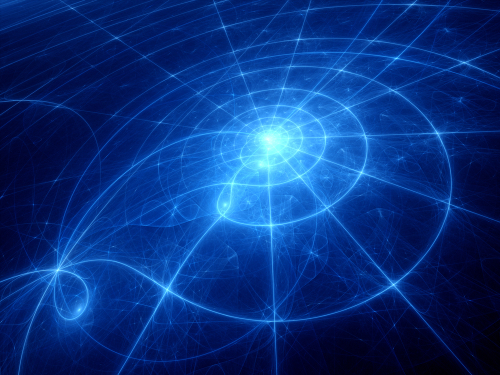 “Biocentrism” and “Beyond Biocentrism” (BenBella Books) lay out Lanza’s theory of everything.